Yep. It’s that time of year again. The time of year where we look back at what was accomplished in 2015, and what lies ahead in 2016. 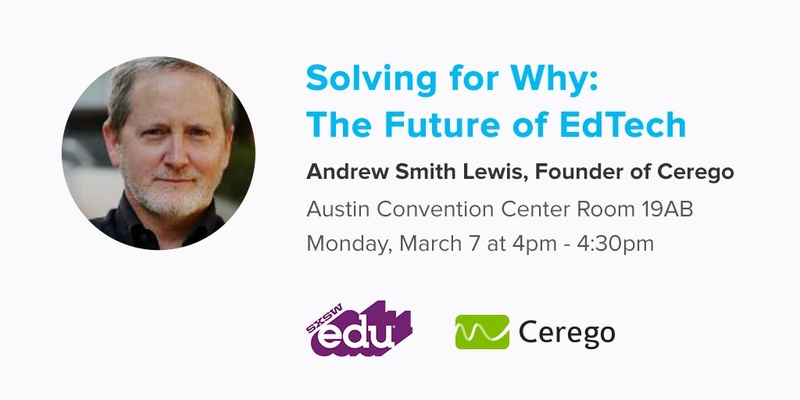 Our executive chairman, Andrew Smith Lewis, has been nominated to lead a solo presentation at SXSWedu next year. We’d love your support in making that opportunity a reality. Please spread the word and vote for our panel at — http://panelpicker.sxsw.com/vote/56814. In “Start with Why,” Simon Sinek argues that we often focus on the wrong things—on the what and how, instead of the why. This statement rings especially true for those of us that live and breathe education every day. In the current edtech environment, getting to the why of learning is more imperative than ever. Prominent innovations have thus far focused on the what (content) and are developing the how (learning methodologies), but to truly transform education and achieve meaningful learning, we must first return to the essential question of why. This question is foundation for this panel. From it, Andrew will explore how traditional educational approaches have demoted the question of why, and how instructors can reinforce why learning is important to students. This keynote will be a continuation of a conversation Andrew gave at EdTech Europe. If you weren’t there the entire Prezi and a synopsis of the talk can be found on Medium here—take a look! How can technology empower and inspire learners, and address the crises of the contemporary education environment? What methodological approaches can we develop to understand the “why” behind our education technologies and their future. How can we think about and design technology experiences that inspire learners and achieve compelling engagement? Join us! And explore the future of edtech as we discuss strategies to foster student motivation through better data, assessment, guidance, access, and technology. Thank you for all the support! See you at SXSWedu 2016!